The Cairns family have been farming in the Mamaku for over 60 years. Today they milk 500 cows at 2.5 cows per hectare. Over the years Tony & Margo have introduced many good nutrient practices. This work was recognised at the 2015 Regional Ballance Farm Environment awards. In this video we take a look at their Effluent Management system. The Cairns family have been farming in the Mamaku for over 60 years. 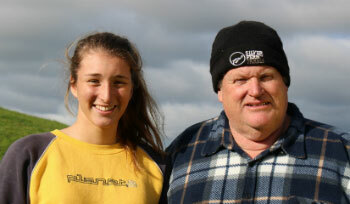 Tony and Margo took over the farm in 1999, five years after it had been converted from sheep and beef to dairy. Today they milk 500 cows at 2.5 cows per hectare. Over the years Tony & Margo have introduced many good nutrient practices. This work was recognised at the 2015 Regional Ballance Farm Environment awards. Today we take a look at their Effluent Management system. When we first took over the farm in 1999, our effluent system was very basic. It was just a small pond, close to the dairy shed, with only 10 hectares of irrigation. We needed greater pond capacity and to shift the pond away from the dairy shed. We started our upgrade in 2005 by adding a 20 thousand litre effluent sump and three hydrants.We have very high rainfall here, about 2.3 metres each year. This means there are long periods when the soil is too wet to spray effluent. In May 2010 we decided on a 90 day storage pond with a rubber lining system. The liner reduces seepage risk and it came with a 20 year guarantee.We also bought a new travelling irrigator and eight irrigator pods which feed off nine effluent hydrants. Today we can irrigate up to 80 hectares. Our soil is free-draining – it’s a podzol soil formed on pumice. This means effluent can easily move into the soil to where it’s needed – the pasture root zone. Last winter there were very few days when we could spray because it was so wet. The large pond puts us in control and makes it much easier to comply with our resource consent.Council’s online soil moisture data helps us decide when it’s OK to spray. We collect a lot of data about our soil and take effluent samples from the fines trap, sump and pond.This data helps us adjust the timing and application rates. 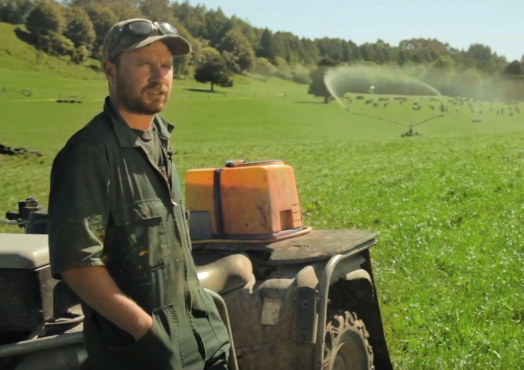 We know the amount of nitrogen going onto our effluent paddocks in any given year. But ANY system’s only as good as the operator. We’re lucky to have John on board who knows the system back-to-front. We’ve set up the system so it’s easy to operate. After milking, the effluent is flushed into the fines pit, which then flows into the sump. Once the sump gets full, the effluent flows into the pond. If soil and weather conditions are right, we irrigate directly from the sump, because fresh effluent has more nutrient value than pond-stored effluent.It’s my job to make sure the system works smoothly and safely. This means keeping up with maintenance, ….. sorting out which blocks to use and positioning the pods in areas the travelling irrigators can’t reach. During pumping, I check the spreaders and make sure there’s no ponding. Once we’ve finished, I record the effluent application depth for each paddock.Where we’re standing is the headwaters of the Awahou stream which flows into Lake Rotorua. This stream is fenced off and the effluent is kept well away from any waterways. The effluent upgrade cost us about two hundred and twenty five thousand dollars. Nowadays, advice on effluent systems is much easier to find. There are more design options on the market but we’re still pretty happy with our system. We’re using effluent to grow grass, improve soil condition and reduce our nitrogen leaching at the same time. The OVERSEER nutrient model indicates that increasing the effluent area reduced Nitrogen leaching by almost 4 percent. The Cairns’ effluent upgrade cost about one thousand dollars per hectare. Running costs are similar to their old system. There are additional benefits from greater flexibility and peace-of-mind from lower risk of system failure and resource consent non-compliance. Apply effluent to land in a controlled way – at a depth and intensity which match the soil moisture and infiltration conditions and topography. Pods provide a low rate application system. The type of travelling irrigators used on the Cairns’ farm can also provide a low rate application system. Effluent Training – visit the Primary ITO website for full course information.